There has been much rejoicing in the Chronister house these past couple of weeks..the latest season of Dr. Who is finally on Netflix streaming! Clara Oswald, the most recent lovely companion to the Doctor, is back for another season. (You can click here to learn about Clara's whole backstory.) In the previous season, the Doctor was a fine, strapping young fellow and there was always this underlying possibility of physical attraction between Clara and the Doctor. The latest regeneration of the Doctor, however, is as an older man, and so a new shade of Clara has become visible - the role of spiritual mother. Specifically, there are seven ways that her spiritual maternity shines through. In the first full episode of the season, Clara undergoes the transition that many a companion before her has; an adjustment to a Doctor who looks very different than the man she has grown to know and love. However, the Doctor is going through a transition himself, and is startled by his new, older appearance. Thanks to a special phone call she receives near the end of the episode, Clara realizes that the Doctor needs her - her support, her love, and her friendship. Although he appears older and gruffer than what she is used to, he is still the same Doctor - a man in need of her love and support. It is the nature of a mother to be a stable force in the midst of change. For a child, a mother is home - a mother is the place where a child of any age can anchor him or herself. This is equally true in spiritual maternity, where a mother is a place of emotionally stability and love. Clara chooses to remain with the Doctor because she comes to realize that he needs her to be a place of stability for him, in the midst of so much chaos. Clara's day job is as a teacher, a role which is featured significantly in this season. As such, we see her interactions with her students, interspersed throughout her day. It's clear that she rules her classroom with a firm but compassionate hand. She is also a teacher to the Doctor. The Doctor is not perfect (no Time Lord is), and he needs someone who will teach him. Clara teaches the Doctor to look at the universe - and himself - through a different lens. He is her teacher (as all "children" in our lives are) but she is very much his as well. When I watch Clara, I am struck again and again by her bravery. There are so many times that she's in a situation and the Doctor says, "Get in the Tardis, Clara!" and she refuses to listen and remains by his side. Yet, it is the nature of a mother to be willing to take risks for the good of another. The love of a mother, any mother, is one that goes beyond the desire to preserve one's own self. Women would never attempt pregnancy, were they preoccupied with self-preservation! Rather, the desire of women (in regards to the vocation of woman) is to give and protect life. A biological mother does that in a very obvious way, but a spiritual one does that in a way that is equally beautiful and profound. In one of the first episodes, Clara travels back in time with the Doctor and meets a little boy (who turns out to be the younger version of her current boyfriend-Spoilers!). Clara was incredibly tender with this little boy. The tenderness toward a child was clearly something that came naturally to her, despite the fact that she doesn't yet have a child of her own. And yet, children sense there is something different about women, something safe and mother-like. It is the unique ability of a woman to be able to mother. During one episode, the Doctor asks Clara why he keeps her around, to which she responds, "Because if you didn't have me, you'd have to develop a conscience!" Clearly, the Doctor does have some sort of conscience, but this scene is fantastic because it highlights a different point - Clara's willingness to be brutally honest with the Doctor. It is the role of a mother to be honest (even critical at times) with her child, in such a way that her love is still conveyed. Anyone can be critical, and anyone can pretend to be loving, but it is a unique quality of maternity/spiritual maternity to be able to offer criticism with underlying tenderness. That tenderness, of course, is ordered toward the ultimate good of the child (spiritual child or otherwise). At a moment's notice, Clara drops whatever she is doing and runs to assist the Doctor. This urgency of response is not unique to mothers, but mothers no doubt possess this ability in a unique way. In my experience as a mother (married to the father of my daughters) a father will respond with great urgency to situations that warrant great urgency. When Therese got her first (and hopefully last) ambulance ride and stitches, Andrew responded with incredible urgency, and calmness. He was a rock for me during that stressful afternoon, and he didn't hesitate to do what needed to be done. On the other hand, when a child is whining for a refill on her glass of milk - not as much urgency. Fathers seem wired for ultimate survival, while mothers seem wired to attending to the smaller details of a child's life (as well as the bigger details, too, of course). Part of that means that mothers respond more urgently to a child's cries than a father does. This isn't sexist - it's just programmed into our make-up, from thousands upon thousands of years of evolving for the sake of survival. A mother is, typically, the first to respond to a baby's cries, because countless mothers before her did, and their response caused their babies to survive and so....built into the genetic make-up. God's clever like that! What's especially remarkable, though, is that this carries over into spiritual motherhood, too. 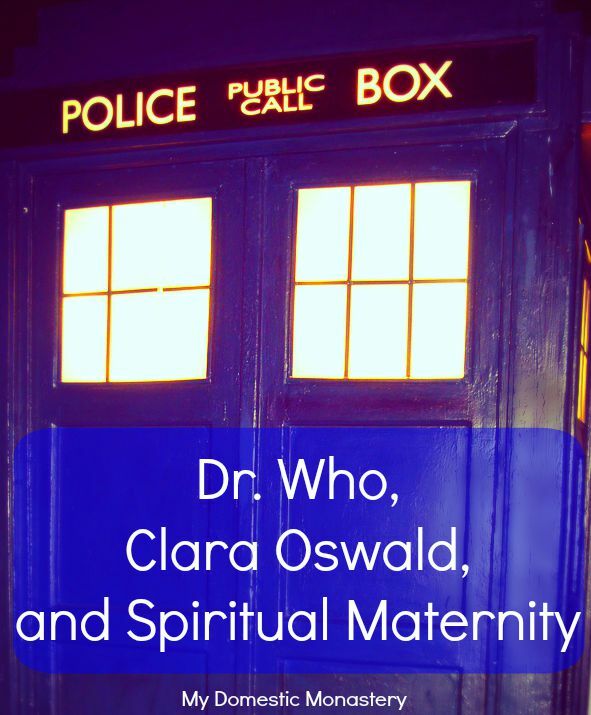 A spiritual mother is able to respond with the same sort of urgency and intuition to the needs of her spiritual child, and so it is with Clara and the Doctor. The greatest asset of any mother (spiritual or otherwise) is her unconditional love. When Clara makes the decision in the first episode of the season to remain with the new/old/gray/regenerated doctor, she does so out of love. She does so because she realizes, when she looks at him, that he is still the same man beneath all the layers. She recognizes that he is still very much in need of her love. A mother loves, plainly and simply, even that which may appear most unlovable. She looks beneath the many layers to see the heart. I once half-jokingly told my best friend in college that I knew that we were really best friends because if she randomly shaved her head the next day I would still love her. What I was trying to get at was not a hatred for people who are bald (I don't hate people who are bald!) but at the fact that, eventually, as love deepens it goes beyond the superficial. It just endures. That is the love of any mother, especially a spiritual mother, and it is the love that Clara has for the Doctor. 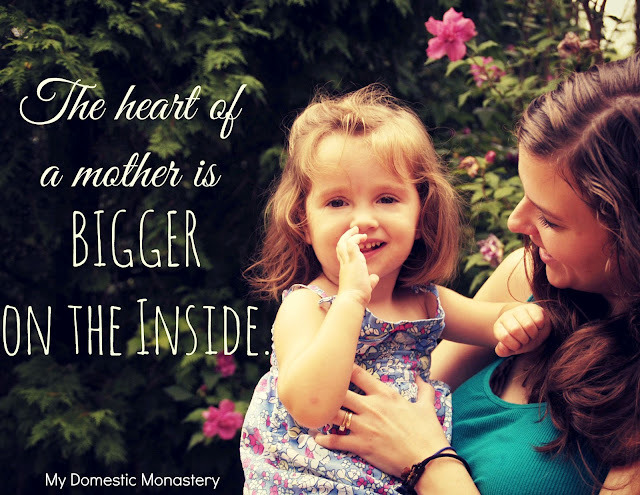 Like the Tardis, the heart of a mother/spiritual mother is "bigger on the inside."